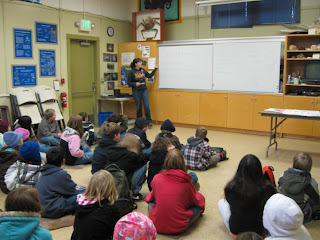 Our Free Science Classes are off to a great start this winter! 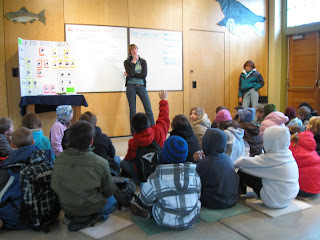 Liza has written the curriculum for two free classes geared toward third graders: Orca Communication and Underwater Sound. Both classes last about an hour and cover a variety of exciting topics. 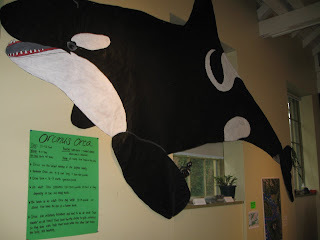 The Orca Communication class, taught in the NHE (Natural History Exhibit), teaches about how Orcas actually vocalize, family groups, inherited vs. acquired traits, differences between transient and resident Orcas, and how changes in the natural environment can affect populations. The Sound Underwater class, taught in the ME (Marine Exhibit), teaches how sounds are made by vibrations that travel in waves, that sound produced in water is louder and travels faster than sound produced in the air, that sound can be described by frequency and intensity, an introduction to hydrophones, and that underwater sound can have an effect on marine animals that rely on echolocation/vocalization to communicate. Although our classes are full of information and cutting edge scientific data, they are interactive and fun for the children! 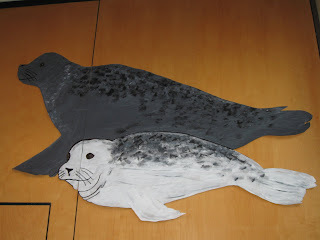 Lucy and I spent a few days painting the life size Orca and Seals to put up in the NHE classroom. Sound, like other waves, is measured by frequency (f) and amplitude (A), as well as wavelength (L) or velocity (v). Some of these are related by this equation: v=f*L. So, in water where the speed of sound is about 1500 m/s, a wave with a frequency easy for us and killer whales to hear, say 10,000 Hz (or oscillations per second), would have a wavelength of 0.15m or 15cm. Thanks for the correction Scott! I inadvertently typed pitch instead of intensity but have changed it in the post.